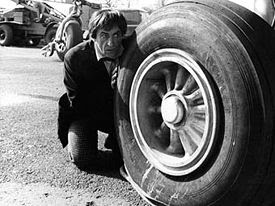 The TARDIS arrives on a runway at Gatwick Airport and is confiscated as a hazard by the police, while the Doctor, Ben, Polly and Jamie split up to avoid arrest. Polly ends up in a store room belonging to the mysterious travel company Chameleon Tours and sees a man killed by another, Spencer, using a futuristic weapon. Spencer reports his actions to his superior, Captain Blade. Polly flees and is reunited with the Doctor and Jamie. When the three travellers investigate, they find the body but are overseen by Blade. The Doctor and his friends head to airport control to warn the authorities of the situation. Lagging behind the others, Polly is captured. The Airport Commandant is sceptical of the Doctor's story, but agrees to accompany the Doctor and Jamie to the Chameleon Tours hangar, but the body has disappeared and there is no sign of Polly. After the trio depart, Spencer resuscitates an alien, a featureless humanoid with prominent veins and a greenish pallor. The hospital's nurse, Nurse Pinto, brings in an unconscious air traffic controller called Meadows. He is connected via a strange machine to the alien, which transforms into a doppelganger of Meadows. The alien Meadows is then sent to work at Air Traffic Control. Back in the main airport, the Doctor and Jamie are stunned to see Polly emerge from one of the newly landed planes. She denies knowing them and claims she is Michelle Leuppi from Zurich. At the Chameleon Tours travel kiosk, Jamie encounters Samantha Briggs, a young Liverpudlian looking for her missing brother, who disappeared on a Chameleon Youth Tours flight to Rome. He was reported to have arrived there and even sent a postcard, but no-one at that end seems to have seen him. The Doctor, Jamie and Samantha break into the kiosk, and discover a pile of fake postcards purporting to be from missing travellers. They also find a monitoring device which shows them the scene in the Tours hangar, where Ben has found the real Polly in suspended animation in a metal cabinet. They watch as Ben is captured and frozen by Blade and Spencer. The Doctor heads off to the hangar to investigate, telling Jamie and Samantha to stay where they are. Jamie and Samantha meet Detective Inspector Crossland, who is investigating reports of young people gone missing after booking flights with Chameleon Tours. Jamie and Crossland realize that the man Polly saw murdered is Crossland's missing partner, DI Gascoigne. The Doctor returns from the hangar, having found the unconscious body of Meadows. The Doctor and Crossland meet with the Commandant, and the Doctor argues that Chameleon Tours is a front for the mass kidnapping of young people by aliens. He proves his theory by demonstrating a freezing gun he found at the hangar. Crossland is persuaded of the threat, and in turn persuades the Commandant to give the Doctor the run of the airport for twelve hours to find out more. Crossland boards the next Chameleon Tours flight and encounters Captain Blade, who holds Crossland hostage with a ray gun until the plane is in flight – after which Blade shows him that all the passengers on board seem to have disappeared. Following an unsuccessful attempt on their lives by Meadows, Jamie and Samantha return to the kiosk while the Doctor meets up with the Commandant, who is worried that Crossland seems to have disappeared, and has learned from checks with other airports that Chameleon Tours has never delivered any passengers abroad. The next flight is to Rome, and unbeknownst to the Doctor, Jamie arranges to get on board, having stolen the ticket Samantha bought for the same purpose. Samantha, determined to get on the plane to track down her missing brother, is sent to see the flight manager – but finds only the murderous Spencer. He has her bound and taken to Nurse Pinto for duplication. The plane takes off with an airsick Jamie aboard and an RAF fighter in pursuit. Captain Blade detects the tracking craft and eliminates it, then redirects the plane upwards rather than forward, using rocket engines to propel it into the outer atmosphere where a vast alien spacecraft awaits. The plane docks and Blade and his flight assistant Ann disembark. Once more the passengers all seem to have disappeared – all apart from Jamie, who is in the toilet. He emerges bewildered and heads to investigate his surroundings, soon finding a store of miniaturised passengers hidden away in drawers. Ann returns and catches him snooping, sealing him in a closed room with two misshapen aliens. The Doctor has worked out from the radar signals where the plane has gone. He confronts Meadows, whom he knows to be a duplicate. The Doctor threatens to remove the black armband Meadows wears, and Meadows, aware that this would cause his death, agrees to talk. He explains that his race was damaged by an explosion on their home world which removed their identities and doomed the species to extinction. They are now reliant on a scientific process of identity theft to sustain and extend their lives, and to this end his people are abducting fifty thousand humans. The originals are being stored in a spaceship above the Earth while the aliens take on their lives and existences. The Doctor uses Meadows to track down Nurse Pinto at the medical centre, but when she resists her armband is removed, disintegrating her and reviving the real Nurse Pinto. Samantha is set free and tells the Doctor that Jamie was on the last flight to disappear. Jamie meets the Director of the aliens - the Chameleons - who has taken on the identity of Crossland. The Director says the plane is now heading back to Earth to collect the remaining Chameleons at the airport. The Doctor has meanwhile worked out which of the airport staff have been duplicated, but says their cover should not be blown lest the abductees be imperilled. The Commandant is given the task of finding their originals, who are hidden somewhere at the airport. The Doctor pretends to be the alien Meadows, re-duplicated into the Doctor's form, while Nurse Pinto impersonates her own double. They board the last flight and are taken to the space station. Blade seeks out the Director to tell him that they have been infiltrated. A duplicate Jamie has been created, who, having the real Jamie's memories, provides the Chameleons with data on the Doctor, revealing that he has considerable powers and knowledge. Blade sends undisguised Chameleons to capture the Doctor and Pinto and bring them to the Director. The Doctor hints at the danger posed to the Chameleons whose originals are still on Earth - including Blade and Spencer. These two Chameleons are given the task of processing the Doctor and Nurse Pinto. The Doctor says the Commandant has found their originals, and that radio contact with Gatwick will confirm this. Spencer and Blade are concerned, but the Director, whose original is safe on-board the space station, cuts off communication with the airport. Meanwhile, Samantha has found the originals hidden in cars in the airport's car parks. The Doctor and Pinto are linked to a duplicating machine. Before the transfer can begin, the one of the Chameleons disintegrates, proving that the real staff have indeed been found. Blade and Spencer draw their weapons and stage a coup, fearing for their lives. A radio link with Gatwick confirms that the Commandant now has the real staff and he threatens to destroy more of the aliens unless the Doctor is released. Blade frees the Doctor, who negotiates a peace between the humans and the Chameleons. If all the humans miniaturised and frozen on the spacecraft are restored, the Chameleons will be spared. The Director and the fake Jamie try to reassert control but are killed by Blade and Spencer. Blade agrees to the Doctor’s terms, and together they track down the real Jamie and Crossland, both of whom revived when their duplicates perished. The planes are loaded with the freed humans, and the Doctor, Jamie and Nurse Pinto join the first flight while Crossland stays behind to keep an eye on the Chameleons. Back in the airport, Jamie gets a kiss good-bye from Samantha, and then rejoins the Doctor, Ben and Polly. When Ben and Polly learn the date - 20th July, 1966, the exact day they first left in the TARDIS - they decide to remain behind, and bid farewell to the Doctor and Jamie. After their friends depart, the Doctor reveals to Jamie that the TARDIS, which had been released from airport storage, appears to have been stolen.